The 'Your Creative Kitchen®' is a series of new and exciting recipes that use some great ingredients to help you be creative in the kitchen! This unique video collection is designed to help those with hearing difficulties by having subtitles included in every video. New recipes are added regularly and the full recipes can be viewed in Rosemary Online. 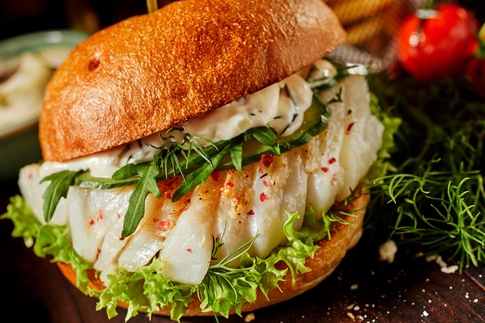 This fish burger doesn't just look great... it tastes great too! This stunning recipe for paella is simply stunning. It's quick too - using frozen seafood, reduced fat chorizo and a paella spice mix you can whizz up a tasty meal in under 30 minutes! Norfolk butcher Richard Dade shows you how to get the most from your fresh chicken. So many ways to use a chicken, means you will waste less and make more! You can't beat this simple pizza! This amazing vegan and dairy free pizza is great for lunch served with a salad or why not add some sweet potato wedges for a great dinner! This tasty, quick and easy spicy dish will tempt anyones taste buds! Make in 20-25 minutes, it's perfect! This recipe serves one, but can easily be adapted for more servings. Healthy Nachos and Salsa for one! Eat healthy for less, just 60p a serving! This is a quick and simple savoury treat that you can make in under 10 minutes! Just 220 calories or half that if you share! At just 175 calories per serving, created in just five minutes and made with 5% fat Greek Yogurt it's a perfect treat/dessert that will make you feel like you've indulged!